Why do women have such a love affair with high heels? Why do men love to see women wearing high heels? From classic court shoes to strappy high heels, thislove affair can, at times, border on obsession. Why can’t we help ourselves from lingering at shoe stores, and from buying high heels online? Put simply, high heeled shoes are empowering for women. Wearing them, we look taller, appear slimmer, and our legs magically give the illusion of being longer. We can look so many more people in the eye – or even look down on them! Who could help but to feel more confident? And when you feel confident, you look confident. High heels draw to both the feet and legs; these have sexual connotations. A woman who is wearing high heels enjoys enhancement of her womanly shape; not only are the legs lengthened, but the buttocks are raised. The feet can also look smaller – and small feet are considered more feminine. There are even scientific research studies that support this theory. A study in Portland, Oregon, found that women are considered most attractive when their leg length is five percent longer than the length of the torso. The raised buttock of a woman wearing a high heel shoe makes her look younger and even healthier. A woman wearing heels walks in an exaggeratedly feminine way, and must stand tall and not slouch – or else she may lose balance! Women, compared with men, walk with more of a hip sway – and this is exaggerated if high heeled shoes are worn. There are even some scientific research studies that resulted in showing that the same woman’s attractiveness to others (both men and women) was significantly higher when she wore heels as opposed to wearing flat or low heeled shoes. Why? Longer legs, better posture, more confidence, and a heightened awareness of her body. Many women who don’t enjoy wearing heels seem to view high stiletto heels as an oppressive symbol for women. This may in part be due to the historical fact that in prior centuries, women were forced to wear heels as a control mechanism by men – as it made it harder for women to run away. Accordingly the natural sensuality of wearing high heels is perceived by some women as a sign of man’s control and even sexualisation of women. Women today are different. We proudly take control of our own sexuality and personal power, and many of us choose to embrace heels – whether they are strappy sandals or wedges or boots. High heels are an ultimate symbol for a woman of her femininity, attractiveness, and confidence. 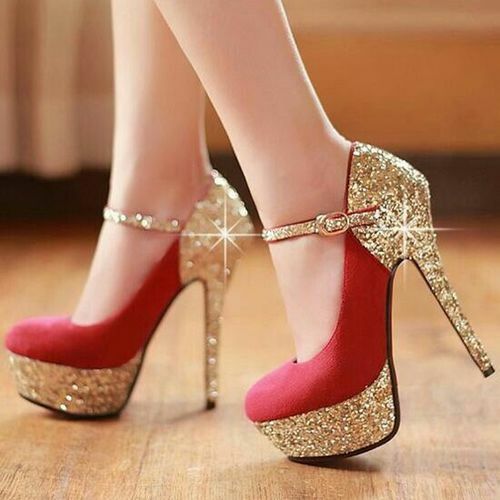 We love to browse and buy unique high heels online. And we all love to check out and envy other women’s shoes. There’s not much that gives us the thrill of a new pair of high heels!